• Sensitive and accurate. Use 10 μL sample. Linear detection range 0.2 to 5 U/L catalase activity. • Simple and Convenient. The procedure involves adding a Substrate to sample, incubation for 30 min, followed by a Detection Reagent and reading the optical density or fluorescence intensity. 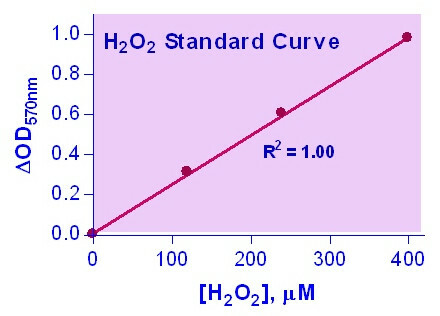 CATALASE (EC 1.11.1.6), is an ubiquitous antioxidant enzyme that catalyzes the decomposition of hydrogen peroxide (H2O2) to water and oxygen. By preventing excessive H2O2 build up, catalase allows important cellular processes which produce H2O2 as a byproduct to occur safely. Deficiency in catalase activity has been associated with grey hair and peroxisomal disorder acatalasia. Simple, direct and high-throughput assays for catalase activity find wide applications. 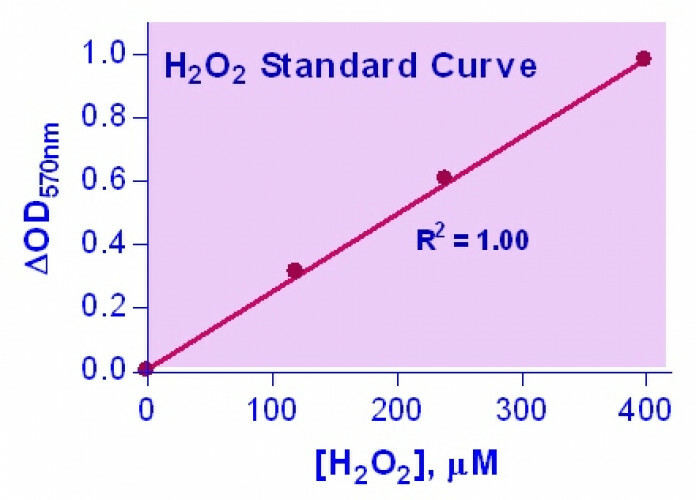 BioAssay Systems’ improved assay directly measures catalase degradation of H2O2 using a redox dye. The change in color intensity at 570nm or fluorescence intensity (λex/em = 530/585nm) is directly proportional to the catalase activity in the sample. Applications For quantitative determination of catalase activity and evaluation of drug effects on catalase activity. References Assay: Catalase in Rat Serum (Pubmed). 2. Zhu T et al (2012) Effects of the iron-chelating agent deferoxamine on triethylene glycol dimethacrylate, 2-hydroxylethyl methacrylate, hydrogen peroxide-induced cytotoxicity. J Biomed Mater Res B Appl Biomater 100(1):197-205. Assay: Catalase in Human Dental pulp cells (Pubmed). 3. Hadzi-Petrushev N et al (2011) L-2-oxothiazolidine-4-carboxylate influence on age- and heat exposure-dependent redox changes in rat’s blood plasma. J Physiol Sci 61(5):437-442. Assay: Catalase in rat plasma (Pubmed). 4. Hadzi-Petrushev N et al (2012). L-2-oxothiazolidine-4-carboxylate influence on age- and heat exposure-dependent peroxidation in rat’s liver and kidney. J Therm Biol 37(5):361-365. Assay: Catalase in Rat Kidney (Pubmed). 5. Labib, HM et al (2010). The Role of Oxidative Stress Markers and Nitric Oxide Levels in the Pathogenesis of Glaucoma. Aust J Basic Appl Sci 4(8): 3553-3558. Assay: Catalase in Human Blood (Pubmed). 1. Chiu CC et al (2012). Beneficial Effects of Ocimum gratissimum Aqueous Extract on Rats with CCl(4)-Induced Acute Liver Injury. Evid Based Complement Alternat Med 2012:736752. Assay: Catalase in Rat Serum (Pubmed).